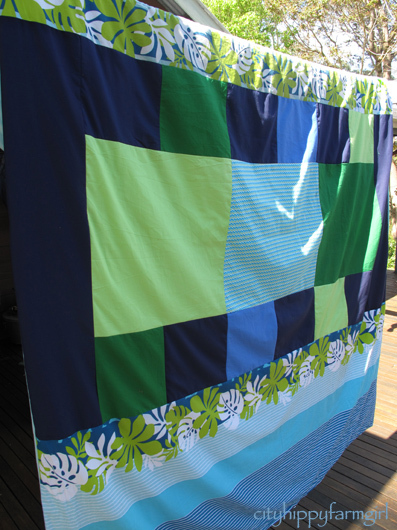 This entry was posted in Making, Creating + Frugal Living and tagged childrens bedrooms, doona cover, hippy bed covers, patchwork, quilting, sewing, upcycling by cityhippyfarmgirl. Bookmark the permalink. 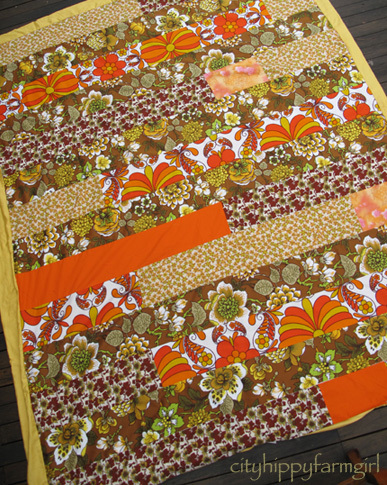 I started making a patchwork quilt many years ago and I’m sad to admit, I never finished it – am bit of a quilting-bee failure. Well done with yours. Great colours. Definitely not a failure. The good thing about sewing is that no matter how much time has gone by, you can always go back to it when the inspiration strikes…even if that’s twenty years down the track! What fantastic efforts. One of my aunts does quilting and patchwork and has made some amazing things over the years – including some for new born babies which I’m sure will be treasured for ever. It’s an impressive art! It is isn’t it. Some of the quilts out there are gob smackingly beautiful… these certainly ain’t 🙂 but I can dream. I love the Hawaiann fabric on the edges of the last one! I’m not good at machine sewing, so these look so good to me! I love patchwork that includes fabric with memories. And doona covers? Perfect for little fingers! Sticky little monkey fingers at that Heidi. I love the colors on that first one. They’re not gloomy colours are there. I’m with Rufus, I love the colours on the first one too! Where did you find such wonderful retro prints? Raided my mums vast stash 🙂 It’s quite handy. Uh-oh, I am seeing dress shaped holes appearing in your curtains! Geez it is satisfying. I’m an absolute beginner when it comes to sewing, but I get a lot of satisfaction from it. 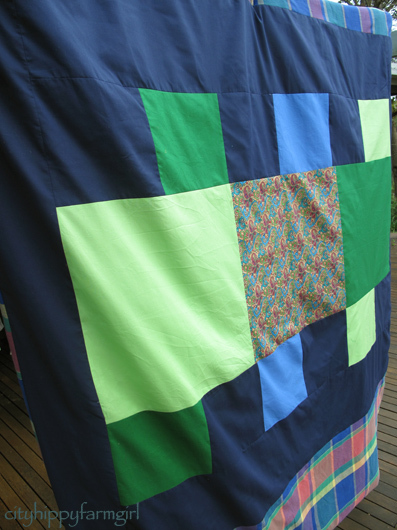 I’ve tried my hand at quilting, made one or two and still have a shelf of fabric waiting to prove my commitment – mind you, that was 12 years ago. Oh well, it won’t go off! When I had my last baby, my aunt made a quilt for her out of some of her old dresses, including some very bold patches from the ’70s. She would really have approved of that top quilt of yours! Good to hear. There is something very happy about those retro prints. Oh, I love these. Very comforting and comfortable. You are one creating and creative woman. The first quilt is very funky, well done! My mum was a wonderful patchwork quilt artist and I was lucky to be gifted a few from her that I treasure. I can’t use a sewing machine at all – I think the Home Economics subject at school really put me off sewing. I would love to learn now though. It put me off too, which is I am really just starting out the last few years. Some teachers can be so uninspiring. That patience and ability certainly wasn’t present the whole time I was making the hippy one. There were quite a few frustrated stomps out of the room, to regroup brain cells.